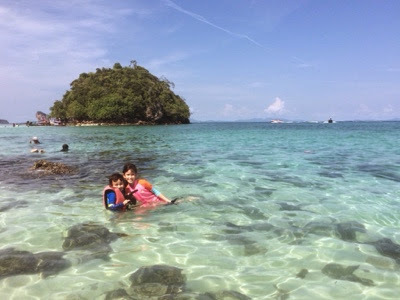 The kids had their mid term school holidays during the last two weeks of October and we decided to take them to Krabi. They had a very good time the previous year when we went off to Phuket to escape the haze in Singapore and so we thought another beach holiday would be nice. 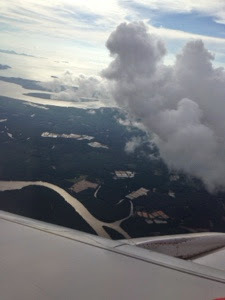 We decided on Krabi since it is not too far away and we could easily get cheap budget flights there. We took AirAsia there as the timing was good, we departed on a Saturday at 3pm and arrived there at 3:30pm due to the time difference of an hour. The flight was uneventful and quick, just 90 mins to get to our destination. It was bearable and within expectations of a budget airline. I would compare it pretty much to taking a standard public transport ride. I had booked a taxi service on Krabitaxi before leaving Singapore and there was a lady holding a sign with my name as we exited the arrival hall. As we were four, I had booked a "private luxury sedan" which was a simple car that would take the four of us comfortably. Nothing fancy but sufficient. We waited about 10 mins after being received before the driver arrived. The lady had some problems calling the driver but once he was there, everything went smoothly. 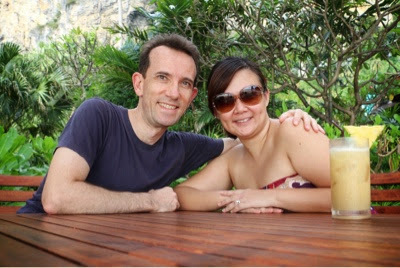 He sent us to the pier where we had to get a speed boat to our hotel, Centara Grand Beach Resort and Villas Krabi. 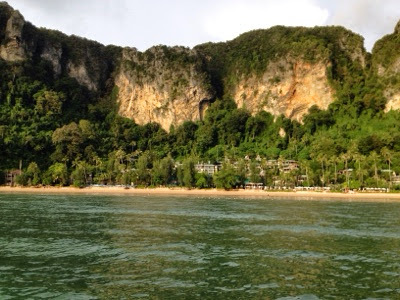 I had researched on the hotels in Krabi and decided on Centrara Grand because it was private, the only way in was through the speed boat or walking about 20mins on a Monkey Trail (which was said to be a little daunting for little ones or when it rains/storms). I kindly of like the idea that we are isolated, but I also booked another hotel for the second part of the holiday where they seemed more kids focused and along the main Ao Nang stretch for the children. Here, we are, approaching the hotel in the speed boat! It looked like a nice little paradise! We checked in very quickly and were shown to our room. It was better than I expected. Very tastefully done. On the second day, we decided to spend most of the time by the pool. It was just SO RELAXING! And we ate by the pool as well! The children had a fun time playing. The kids club was also a blessing. Almost all the time that we brought the little ones, they were the only children. So they had the attention of the carers and was able to participate in the craft activities with undivided attention from the staff. During our five days, they managed to make a piggy bank and a photo frame as well as learn how to speak Thai! 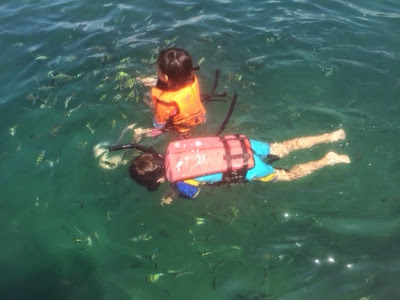 One of the mornings, hubby took the girl and the boy on an excursion trip to visit the Four Islands for snorkeling as I needed some quiet time to complete an assignment I had due. They came back with amazing photos! The water was so clear! They totally enjoyed themselves and said that this is definitely a highlight of the trip for them. This is just beautiful! Crystal clear water. And hubby and I enjoyed some romantic moments when the children were in the kids' club. We were able to have drinks by the beach, had some couple time and relaxed. 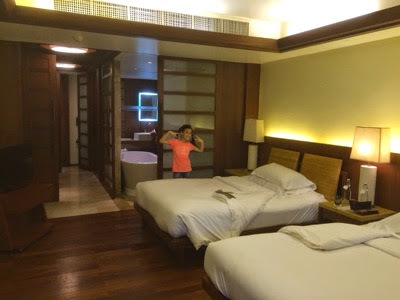 All in all, We all had a great time at Centara Grand and there was enough activities or space to do things as a family, as a couple and even individually as well (Both hubby and I went for our 90mins massages separately too). Centara hotel group has a cash bonanza promotion where if you deposit a minimum of 10,000 baht, they would give an additional 30% (or more) bahts in the account. Which meant that you would enjoy some discount off the food and spa bill at the end of the stay making it a bit more affordable to spend within the hotel. 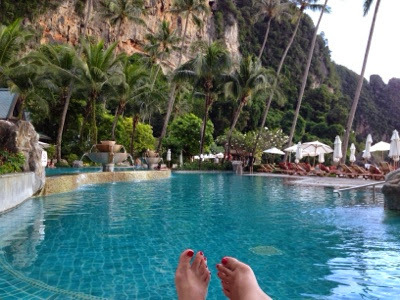 After four nights in Centara Grand Beach Resort and Villas Krabi, we moved to on to our next hotel. The post will continue in Part 2.